El Español worked with a local Spanish crowdfunding platform. "Popular journalists add to the narrative behind the campaign and may lend trust to the venture." De Correspondent’s platform was made to emphasize the number of people who gave to the campaign and de-emphasize the amount of money raised. Organizers of the campaign made it clear early on that they needed 15,000 backers to pay an annual subscription of €60 in order for them to have the seed money they needed to get started. Krautreporter used a thermometer-like visual that stretched across the entire page to count from 0 to 100 percent for their campaign to raise €1,000,000. They would later regret that decision, said Krautreporter’s Frederik Fischer. People are most likely to back campaigns they think will succeed, and visualizing the ascent from zero to one million euros can look like a steep, slow climb, especially after the rush of excitement and funding ends after the first couple of days, and you reach what Fischer calls the valley of death. 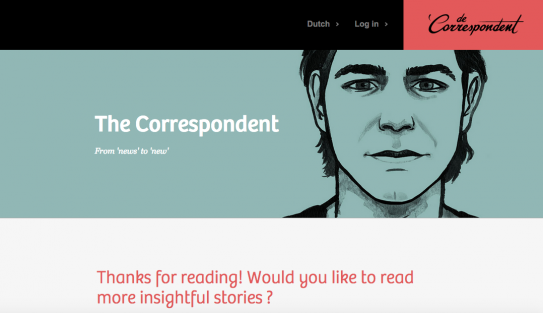 Before launching their crowdfunding campaigns, De Correspondent and Krautreporter hadn’t published a single story. Technically, El Español began to publish some stories during their campaign but it was sort of a soft launch, by no means intended to reflect the full experience readers could come to expect from El Español. “We don’t need a travel or career section, just because advertisers like those. We don’t need to hunt for page views. We don’t have to compete with huge social networks for ad budgets. And most importantly: we don’t have to turn our members into a ‘target group,'” Fischer said. El Español knew how to attract an audience. In a recent CJR article, El Español editor Pedro Rámirez was called “probably the greatest Spanish (and European) journalist of the past 25 years.” He comes to the startup from El Pais, the second largest paper in the nation, while co-founders of El Español publisher No Hace Falta Papel both came to the news startup from El Mundo, the largest newspaper in Spain.